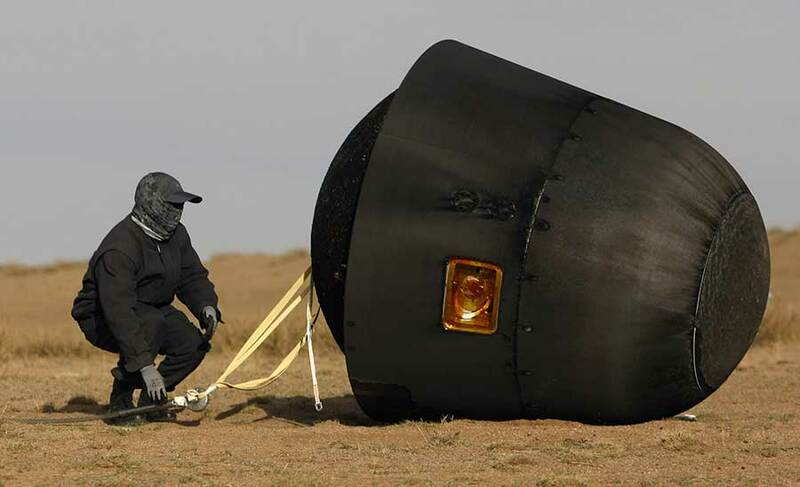 The returning capsule from SJ-10, China's first microgravity satellite, landed safely at 4:30 pm on Monday in Siziwang Banner, in the Inner Mongolia autonomous region. Resembling the shape of a bullet, the SJ-10 modules carried 19 experimental loads that sought to shed light on microgravity and bioscience. Eleven of the experimental loads were aboard the returning capsule following its 12 days in orbit. The other eight will remain in orbit for a few more days aboard SJ-10's orbital module. "The returning capsule brought back nine bioscience experimental loads and two microgravity experimental loads," said Duan Enkui, deputy chief designer of scientific application systems on SJ-10 and a professor at the Institute of Zoology affiliated with the Chinese Academy of Sciences. "So far, all the experiments are going well, and some have already produced surprising achievements." On Sunday, Duan's team announced that high-resolution images sent back from the satellite enabled scientists to prove that early-stage mouse embryos could develop fully into blastocysts. It was the first time such an experiment had been successfully conducted. "Embryonic development starts from a single-cell fertilized egg, which divides into two cells, four cells, eight cells, ... until it forms a blastocyst that can be implanted in the womb," he said. "Now, we have proved that this important process of embryonic development is possible in a space environment. Maybe, next time, if we have a returning capsule that stays in orbit for three or four days, we will actually be able to transfer the blastocysts into females and see the birth of space mice." The embryos completed the whole development process within four days of the launch, but the returning capsule had to spend 12 days carrying out other experiments before it could head back to Earth. So scientists used chemicals to fix the developed blastocysts so they could carry out further analysis after their recovery. Scientists collected data from other experiments during the 12 days in orbit. For example, they lit organic glass and polyethylene materials inside one of the experimental loads and received data and images related to the burning process. The experiment is aimed at understanding the risk of fire on manned spacecraft. According to Wang Shuangfeng, an assistant researcher from the Institute of Mechanics affiliated to the Chinese Academy of Sciences and the person in charge of the burning experiment, the combustion process in the weightlessness environment of space is different to that on the ground. "We have to figure out the fireproof properties of nonmetal materials so as to draw up usage standards and prevention protocols to ensure astronauts' safety," Wang said. After the recovery of the returning capsule, more in-orbit experiments will be conducted, including larger scale combustion tests. Hu Wenrui, the chief scientist for the SJ-10 project and a member of the Chinese Academy of Sciences, said the recoverable capsule gives China an advantage in microgravity research. "With the recoverable capsule, we can carry out some higher-risk experiments in the orbital module after we recover the experimental loads from the other experiments," Hu said. Microgravity experiments are normally carried out in various space facilities, such as space stations, shuttles, research rockets and orbiting satellites. So far, only China and Russia have launched recoverable satellites. "Now, we are researching the possibility of producing reusable satellites, and I hope we can make some progress during the 13th Five-Year Plan," he said, referring to the 2016-20 blueprint.